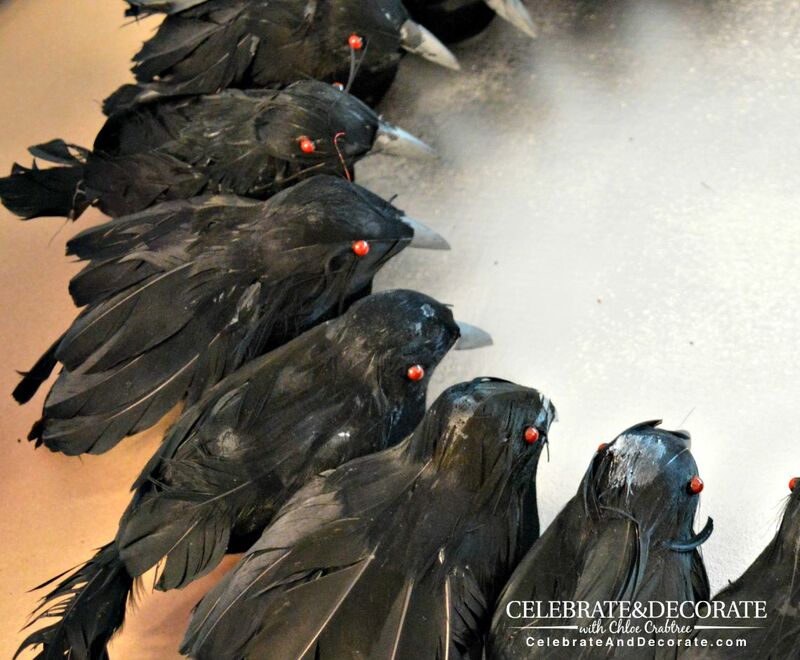 I have decided to decorate with black crows for Halloween this year on my new front porch. 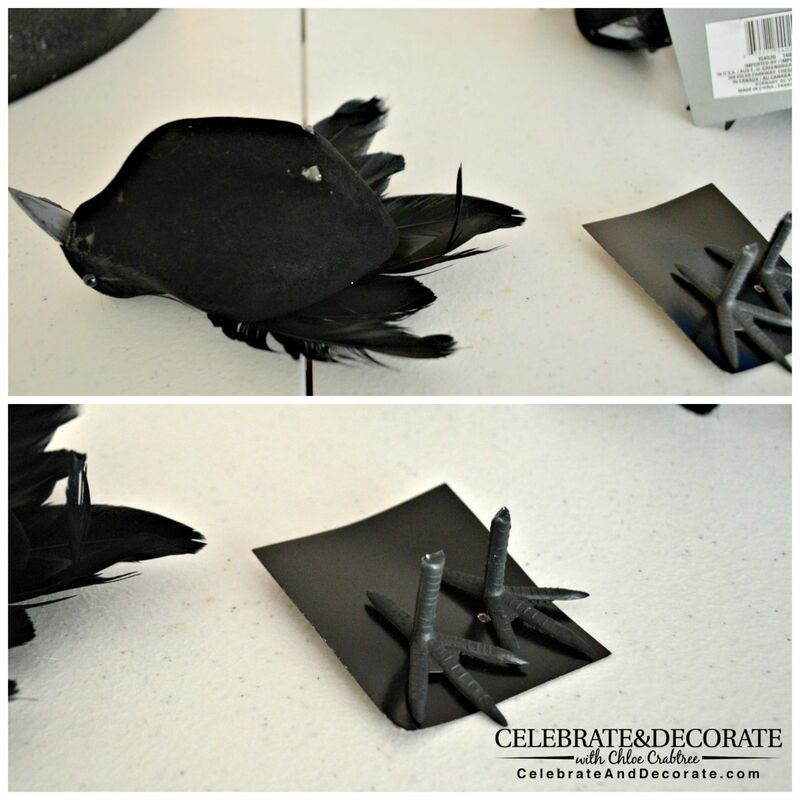 I bought a number of crows last year at the Dollar Tree and never had a good idea for how to use them, but time changes that and here I am with all my crows and I have begun to formulate my ideas for my Halloween decor. 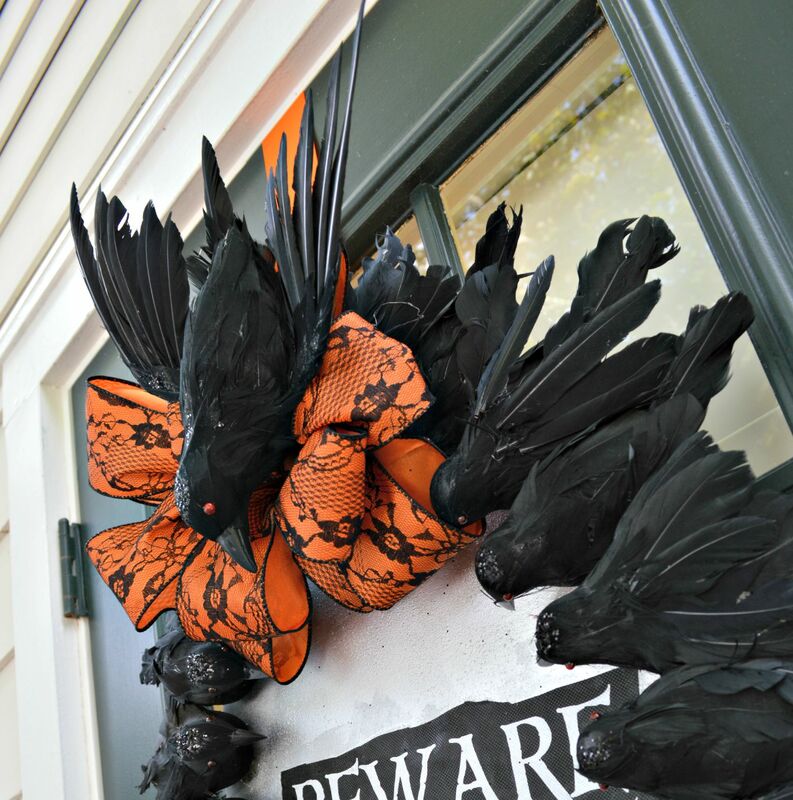 I wanted to begin with a door decoration so I will show you how to create a Halloween Wreath with creepy black crows. 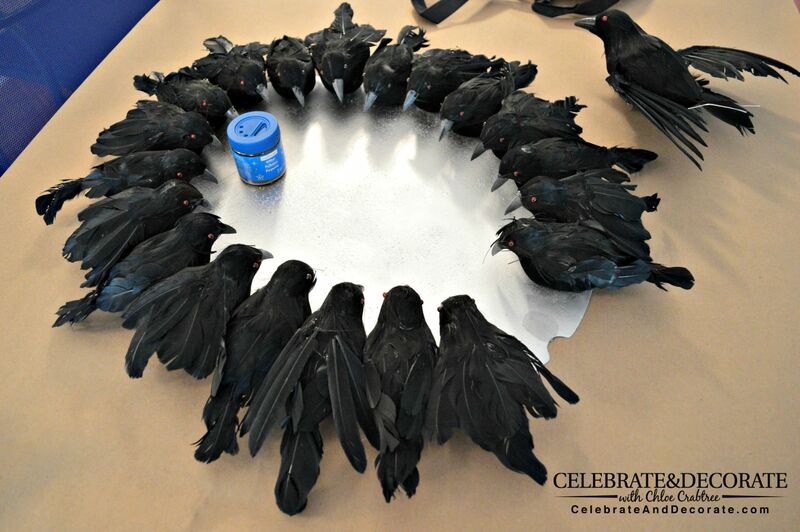 My original thought was to glue these Dollar Tree crows onto a wreath form. 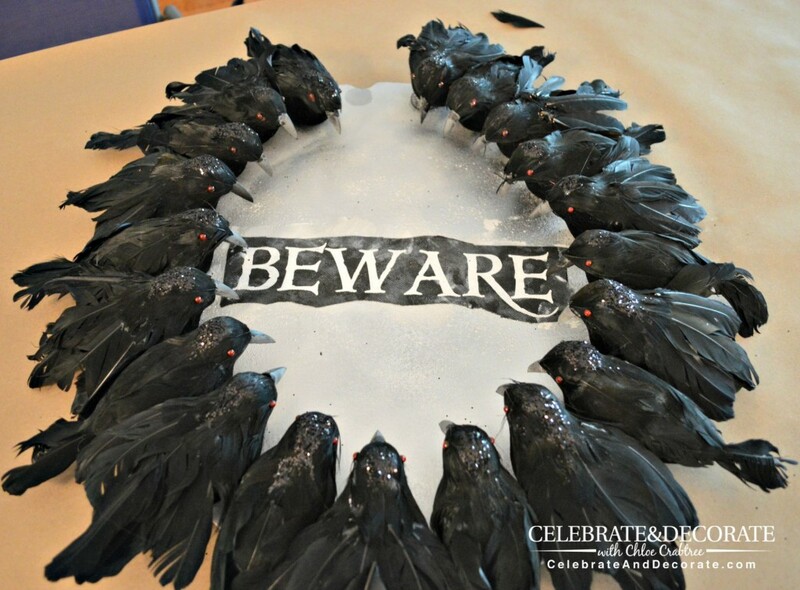 I found this fun black glittery wreath below on sale at JoAnn’s, but when I put the crows on it, they just looked like they were floating and it just didn’t seem right. I am sure I will use that wreath form for something, I am not worried about that! Instead I went out to my studio and found this oval cardboard from the back of an old picture frame and immediately knew this would be my base. I was kind of excited that it was going to be oval and not round, I don’t know why, but I just felt that made it a little creepier. 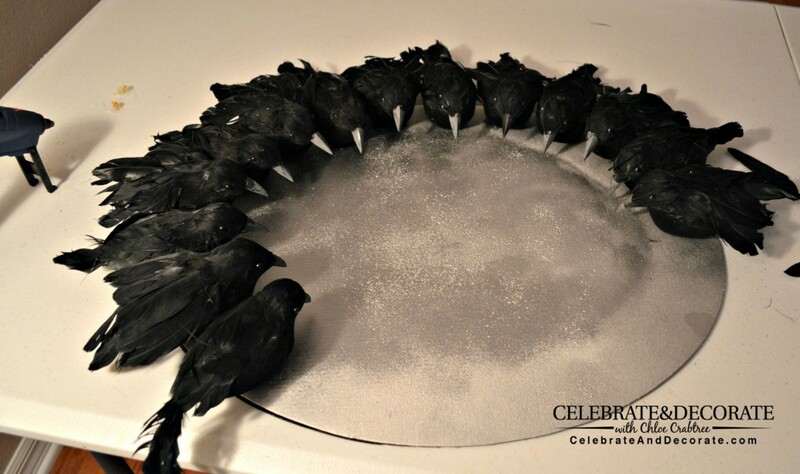 I sprayed the cardboard silver and then took all of my crows and (no real birds were used in the creation of this wreath) cut off all of their legs with wire cutters. After all of their legs were cut off, I began gluing them to the silver oval with my hot glue gun. I thought I had plenty of these birds, but of course when I got to the end, guess what? I was short one bird! Look at that gap! This would not do! Trips to all of the local Dollar Tree stores have turned up spiders and rats but no crows. I did find some really big crows with spread wings at my local At Home store, so I picked up a few of those for my front porch. When I got home, I decided I would just add a bow and one large crow, as if he is the king of the crows. After all of my small crows were glued on, I decided they needed a little more creepiness, so I used some .99 red nail polish and painted all of their eyes red. It doesn’t show up very well, but in person, it really makes a difference. My king crow got the same treatment. 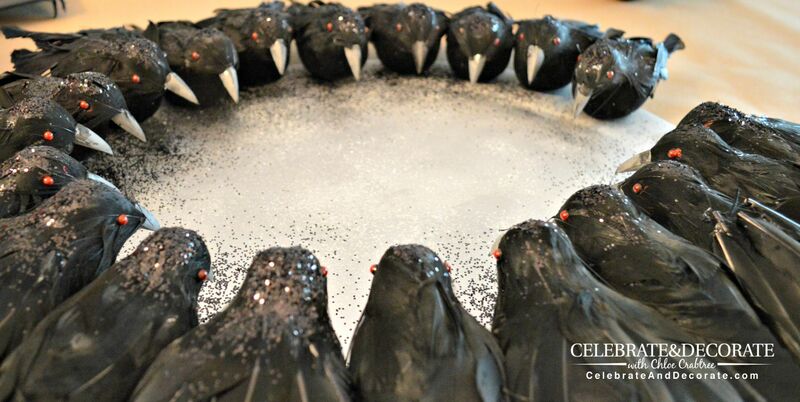 I also decided a little black glitter would add a bit of shimmer, so I brushed a little craft glue to the head of each crow and sprinkled a little black glitter on each of them. I am really happy with the outcome. 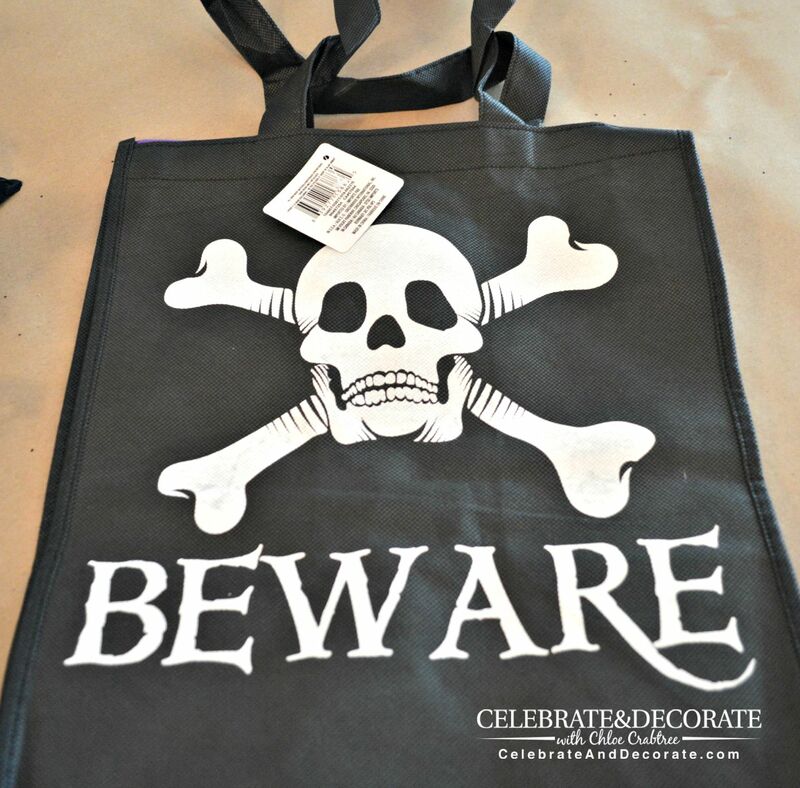 I knew I wanted to warn Halloween visitors to “beware” of the crows, and while I was at Dollar Tree I spotted this trick-or-treat bag with a skull and crossbones and the word BEWARE. Oh that was just perfect, and at $1 the price was right. I cut the BEWARE from of the bag and put the skull and crossbones away for a future project. 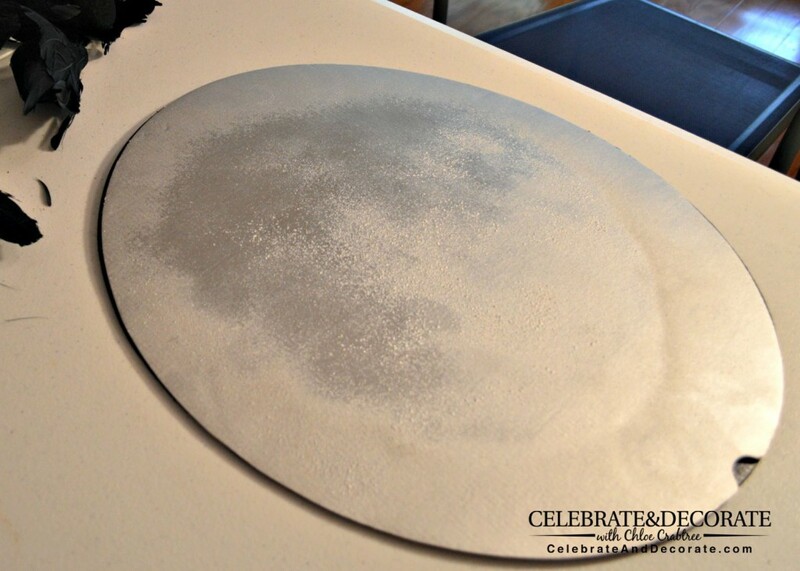 I then used Mod Podge to attach the BEWARE to the center of my silver oval. I needed to fill that gap, so I used this great orange and black lace ribbon I found at Michael’s, tied a bow, attached it and then added my king crow to the top of the bow. I imagine he is holding court, giving his minions their orders for a spooky Halloween! My door will be all ready to greet warn the trick-or-treaters. 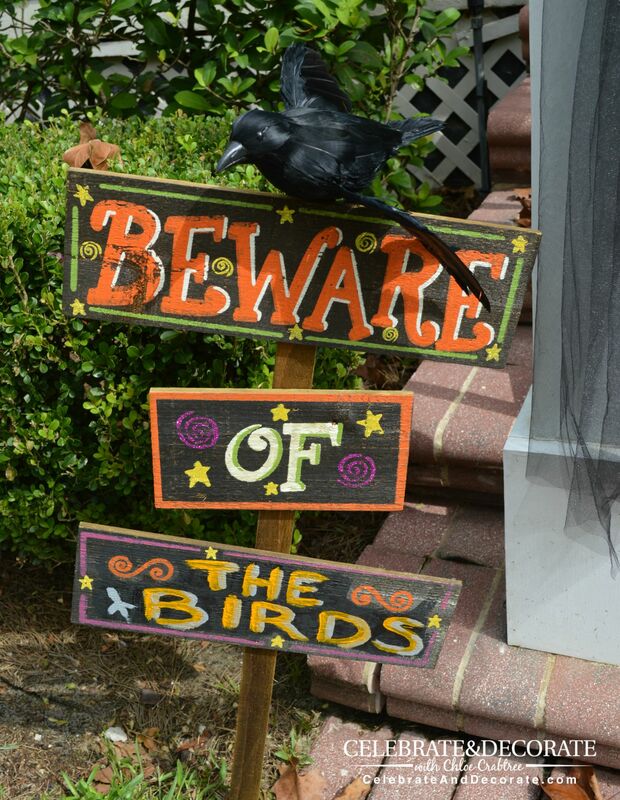 Beware the birds should you come to my house this Halloween! Thank you for stopping by to check out my wreath, Judith! It’s definitely a creepy wreath. Have a Happy Halloween! Halloween is my favorite holiday! I love, love ,love this wreath. So clever and fun! Pinning and will definitely be sharing next month. Happy Fall! Thanks Dawn, I am anxious to decorate the whole porch with all my birds! EEEEK! That would be fun, and creepy, wouldn’t it!? So many clever ideas in one project! Great results for little money. Well done, Chloe. Thanks Laurie! It was only $25 total! Jamie, you gave me a good laugh! Good luck training those crows to sit on your wreath! Thanks Danielle! I am ready to hang it on the front door! That is great, love it! Thank you Christine, I am really happy with how it turned out! Creepy but cute! Your tutorials are fun and you make it look so easy! This was so EASY and INEXPENSIVE! Thanks Ritu! See you next week! What a great and easy way to add a little eerieness to a front door. Love it! Have a beautifull day. Thanks Tina…and it was easy! Reminds me of that Alfred Hitchcock movie, Birds, or The Birds??? I forget. Wonderful creepy wreath! The Birds is the first thing I thought of too! Definitely not your run of the mill Halloween wreath. I love it! Pinning and G+ing it. Thanks so much for sharing it! It was so easy to make! Love that! I bought one of those birds for an arrangement under my big glass dome but I love your idea! 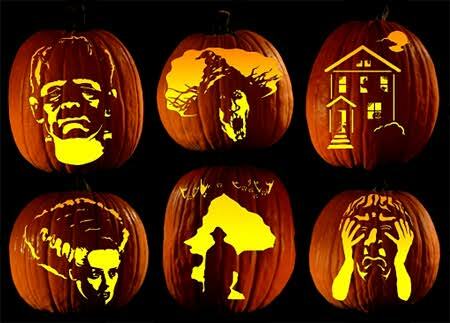 So creative and befitting the season! You did a great job! Thanks for sharing a tip and using affordable items! Happy Halloween/Happy October to you. Thank you Barbara, I love putting things under those glass domes for all kinds of holidays too! This wreath is so cool! 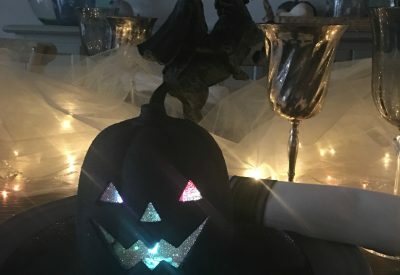 Stopping by to let you know you were my feature pick for the Halloween Spooktacular party! Sharing to day on social media! Have a great weekend! Thank you so much Kim!! I will be sharing and sending people your way! 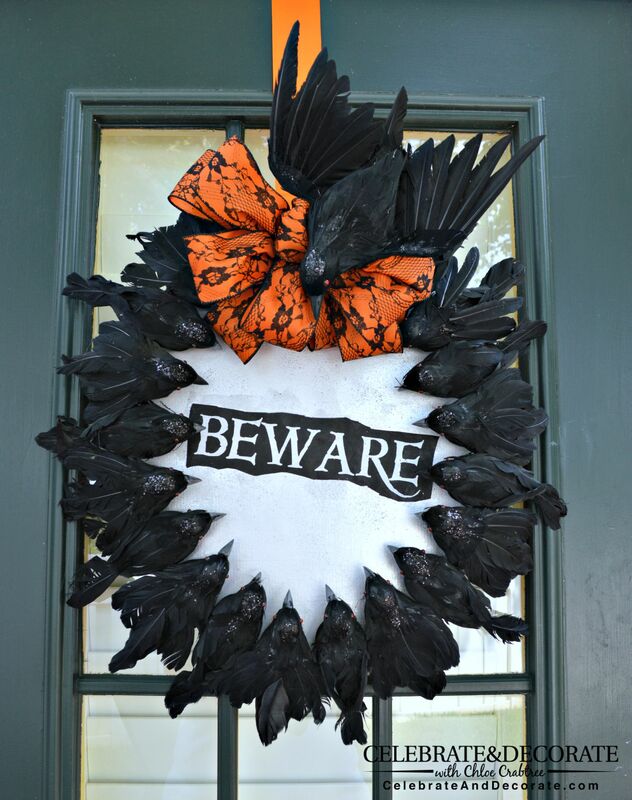 I really like this Halloween wreath. Crows always remind me of the classic movie The Birds which gives it that creepy vibe. Pinned for later. Thanks Theresa, that was exactly the creepy feeling I was going for. That movie really scared me the first time I saw it! 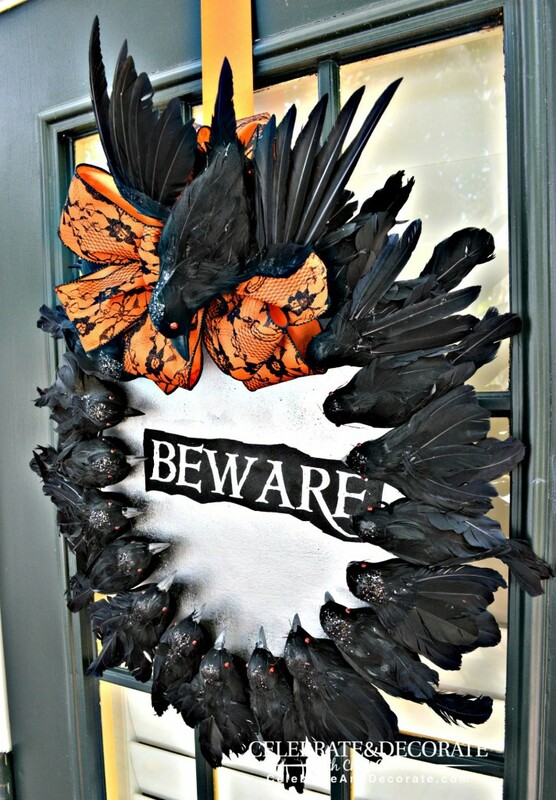 This is definitely the best Halloween wreath that I have seen. I feel as though it is a common misconception that wreaths are only for the holiday season, although wreaths are the perfect home decor. 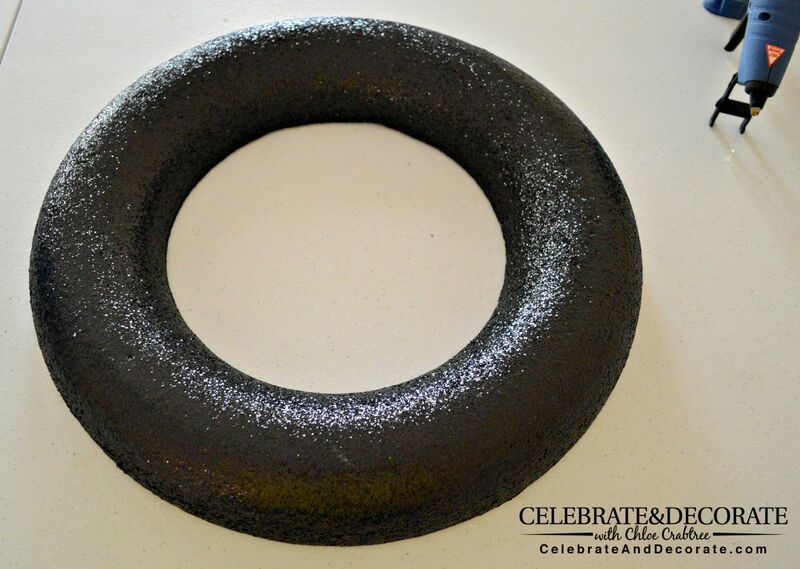 They can be adjusted for every season or holiday, they are easy to DIY, and they can be placed in a plethora of different places in your home.